To satisfy a need to maintain presses which are mechanically sound but have problematic electrics, Rapidfil developed a PLC Control Upgrade for older presses. An older press can be easily be brought into the 21st century by installing new controls. The program is very user friendly and can offer a lot of flexibility. We have designed a retrofit for Bucher presses that are fitted with electronic cards on the press doors. These cards can be problematic and difficult for local technicians to troubleshoot. Our retrofit allows standard electricians and mechanical tradespeople to be able to fault find and rectify problems, avoiding the need for costly I2C Cards and the headaches associated with them. Our PLC controls are intuitive and allow the winemaker greater control over the pressing process. With control of each pressing step, rotations, pressure and pressing time. 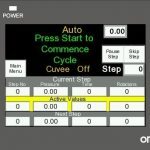 The Omron PLC and colour touch screen are cost effective and can be supported in most areas, by local systems integrator’s. Omron has a very long life cycle on its component products which are all backwards compatible.